Michael was admitted to practice law in New Jersey 1972, having graduated from the University of Arkansas – School of Law, Fayetteville, Arkansas, the same year. Michael is a Vietnam Veteran, having served a tour of duty in Vietnam for 13 months. 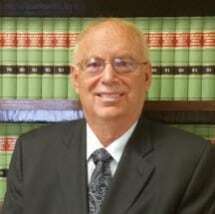 Michael began his practice in Somerset County in 1973 as a sole practitioner. Within two years, Michael was appointed the Municipal Judge for the Borough of Manville and acting Judge for the City of Irvington, during 1974 – 1980. Michael also served as the School Board Attorney for the Borough of Manville and represented Hillsborough Township Board of Adjustment as the Board Attorney. In 1980, Michael successfully presented a case to the Superior Court of New Jersey, Appellate Division, Rybski v. Johns Manville, a seminal case that interpreted functional loss under the new Worker's Compensation Statute. Michael has handled numerous asbestosis and mesothelioma claims in the Worker's Compensation Court throughout the State of New Jersey. Michael is a former member of the Board of Adjustment for the Township of Bedminster. Michael's practice has expanded over the years and his professional expertise has guided many clients to a successful conclusion. The practice continues to expand. Today, the Law Office of Weiss & Weiss, LLC, will continue to represent clients in the same manner that has been practiced in years past and will continue to offer professional expertise and guidance in the areas of law practiced by this firm.